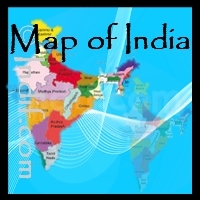 India is the seventh largest country in the world in terms of area. It is the biggest country in Southern Asia, which covers an area about one-third the size of Europe. The Indian subcontinent is surrounded by three different water bodies and is easily recognisable on the world map. The mainland of India extends between 8°4' and 37°6' N latitude and 68°7' and 97°25' E longitude. The Tropic of Cancer 23°30' N divides India into almost two halves. The country can be divided into these distinct geographic regions: the Himalayan region in the north, which contains some of the highest mountains in the world, the Indo-Gangetic Plain, the Desert Region, and the plateau region in the south and central part. Himalayan Region: India comprises the Himalayas in the North and Northeastern region, which divides the country from the Tibetan plateau. The Indian part of Himalayas covering an area about 5 lakh sq km (about 16.2% of country’s total geographical area) and forms the northern boundary of the country. These great range of mountains separates India, along its north-central and northeastern frontier, from China (Tibet), and extends between latitudes 26°20’ and 36°40’ North, and between longitudes 74°50’ and 95°40’ East. 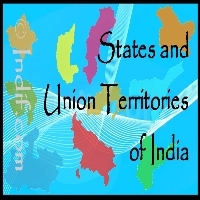 The Indian Himalayan Region spreads through 10 states of India namely, Jammu & Kashmir, Himachal Pradesh, Uttaranchal, Sikkim, Arunachal Pradesh, Meghalaya, Nagaland, Manipur, Mizoram, Tripura, and hill regions of Assam and West Bengal. The Indo-Gangetic Plain: The Indo-Gangetic Plain is also known as the Great Plains or the North Indian River Plain, is dominated by three major rivers - the Ganges, the Indus and the Brahmaputra. It cover a large area of about 7,00,000 sq km in the Northern and Eastern India, the most populous parts of Pakistan, and virtually all of Bangladesh. The Indo-Gangetic plain (including regions of Pakistan, India, Nepal, and Bangladesh) is generally characterised by fertile soils, favourable climate and an abundant supply of water. Some geographers subdivide the Indo-Gangetic Plain into three parts: the Indus Valley (mostly in Pakistan), the Punjab (divided between India and Pakistan) and Haryana plains, and the middle and lower Ganga. These regional distinctions are based primarily on the availability of water. By another definition, the Indo-Gangetic Plain is divided into two drainage basins by the Delhi Ridge; the western part consists of the Punjab Plain and the Haryana Plain, and the eastern part consists of the Ganga-Brahmaputra drainage systems. The Bhabhar Belt - is adjacent to the foothills of the Himalayas and consists of boulders and pebbles which have been carried down by the river streams. The Terai Belt - lies next to the Bhabar region and is composed of newer alluvium. The region is excessively moist and thickly forested and receives heavy rainfall throughout the year. The Bangar Belt - consists of older alluvium and forms the alluvial terrace of the flood plains. In the Gangetic plains, it has a low upland covered by laterite deposits. The Khadir Belt - lies in lowland areas after the Bangar Belt. It is made up of fresh newer alluvium which is deposited by the rivers flowing down the plain. The Desert Region: The Desert regions are: The 'Great desert' extending from the edge of Rann of Kutch beyond the Luni river northward, embracing the whole of Rajasthan-Sind frontier, and the "Little Desert" extending from the Luni river between Jaisalmer and Jodhpur up to the north. Between both the deserts is rocky waste. Below the state of Punjab and extending southwest along the Pakistani border is the sparsely populated Thar Desert. This desert covers most of the state of Rajasthan, and 3,000 square kilometers (1,158 square miles) of its terrain of sand dunes and flat thorn scrub is protected as the Thar Desert National Park. The Deccan Plateau and Peninsula Region: The largest of India's plateaus are the central Malwa Plateau between the Aravali and Vindhya Ranges, the Chota Nagpur in the northeast of the peninsula, and the Deccan Plateau. The Deccan Plateau and Peninsula, extending south of the Vindhyas is geologically the oldest portion of the Indian land. The name Deccan, which means "south," is often applied loosely to all the elevated land of southern India. More properly, however, it refers to the western portions of the irregular central plateau. The Aravalli, Vindhya, Maikala and Ajanta mountain ranges separate this Plateau from the Gangetic plain. The Deccan plateau system averages about 762 meters (2,500 feet) in elevation in the west and about 305 meters (1,000 feet) in the eastern parts. Climate of India: India's climate is also varied but is tropical in the south and mainly temperate in the north. Much of the subcontinent depends on the winds from the monsoon to blow rain across the Indian Ocean from June to October. The plains in the north, are less dependent upon the winds than is peninsular India because those rivers are fed by melting mountain snows. he country encounters four different types of seasons - winter, summer, monsoon, and post-monsoon. In some states, the temperature in summers rise up to 45°C and minimum temperature decreases to 15°C only. In winters, the average temperature is about 10-15°C.